This is the site of Dr. Robert B. Bates DC, MMQ, an avid Qigong practitioner, Qigong teacher, and Qigong healer. Robert is also a licensed Doctor of Chiropractic, Cranio-Sacral Therapist, Medical Qigong Therapist, and Lymph Drainage (Dray nahj) Therapist. This website is divided into two main parts: An ongoing blog of articles and announcements and regular web pages with information. Go to the Master List of Principle Articles page to scan the list of posts. See the “Pages” section to the right for more information. This website and blog is all about the great healing and movement art known as Qigong (say “chee gung.”) Qigong is a an Ancient (and modern) approach to wellness and healing. In fact, it has been used as a primary healthcare for thousands of years. The Fun with Qigong website celebrates and elucidates the power of Qigong for self-healing. Learning new exercises, sets or forms—or deepening your understanding of a move—or set is satisfying, and good for you. 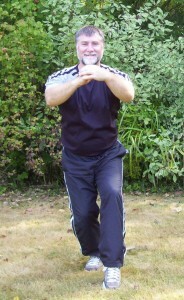 Qigong is fun to practice. On this site, in both the blog posts and pages, are descriptive articles of Qigong, explanations of Qi and Qigong, photos of exercises, videos, exercise suggestions, and even a few opinions. There is an ever-growing collection of self-empowering exercises, prescriptions for all kinds health issues. Robert Bates is currently on sabbatical from teaching public courses in order to focus on some personal Qigong training and his busy professional healing practice.